Be ready before you receive a complaint. This training will examine how to respond to a complaint of discrimination and/or harassment. It will cover what effective questions to ask, how to craft a thorough investigative report and how to mitigate your organization’s risk. 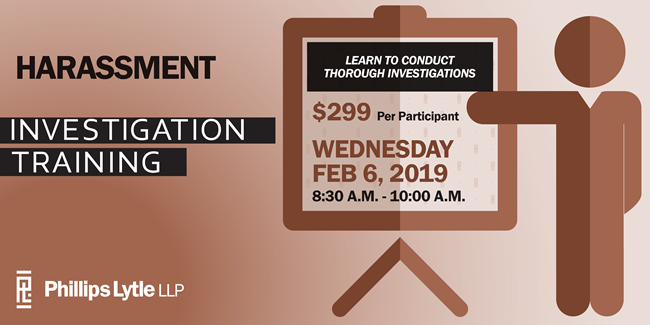 You will walk away with first-hand knowledge on all steps needed to conduct a thorough investigation, including how to inform employees of the result of the investigation. Please make company check(s) payable to Phillips Lytle LLP. Registered attendees may send payment to the below address up to one week prior to the related training or provide on the day of the event. This program has been submitted for pre-approval of approximately 1.5 credit hours with the HR Certification Institute (HRCI). For more information, please visit the HRCI homepage at www.hrci.org.